I grew up around old people, and as a child of nine years whose mother worked as a sole charge nurse in a number of aged-care homes, I got to know many of the patients by name. A bespectacled lady called Daisy taught me how to knit, a mute named Sylvia to write with my left hand, and Sam... well, he taught me not to smoke. Sam terrified me every time he would follow me down a hallway with his emphysemic rattle and persistent wheeze. Gaunt and ashen, he had been a heavy smoker all his life. I would watch my mother dispense his daily allowance of cigarettes (usually three) with his medications after breakfast, but also knew he rolled his own thanks to contraband smuggled in to the resthome by other patients. But that was our little secret. Right up until the day before I found him lifeless one morning in his bed, I would watch Sam roll his illicit cigarettes and would always indulge if invited to push my nose into his outstretched bag of stringy cured tobacco. It smelled pungent and sweet. Now, some 30 years after Sam's passing, I recall that distinct odour... though not by way of a bag of tobacco. 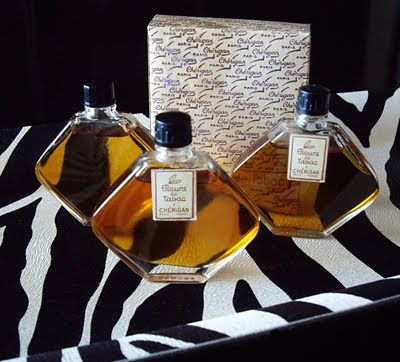 Chérigan Perfumers is a company for which there is little recorded history in the public arena. It was said to be established in the 1920's in Paris by a Czech immigrant named Ota Polacek whose Champs Elysées address was shared by so many influential perfume houses of that age. In 1929, no less than three perfumes were launched to the house's credit: Mascarades, Chance, and Fleurs de Tabac. Examples of all three perfumes (as well as a number of others released in the 1940's) still exist to this day, though they are found quite infrequently. Fleurs de Tabac is a wonderful example of the European penchant for tobacco-inspired scents in the 20's and 30's, and is the cause of today's vivid recollection from my youth. It is often Tabac Blond - the masterwork of perfumer Ernest Daltroff and founder of the house of Caron - that is seen as the yardstick against which all other tobacco scents are measured, however Fleurs de Tabac emerges as a strong contender for the ultimate tobacco accolade. Whilst Tabac Blond was primarily marketed to women, Fleurs de Tabac was geared towards men; although it is fair to say that both perfumes seem to have a shared respect and appreciation across both genders. Fleurs de Tabac is a paradigm of masterful blending. Without any olfactory notes to refer to, I follow my nose and enjoy a brisk citrus opening and am instantly charmed by a dry, smokey vetiver which swells from beneath. There is an 'unaired' mustiness that the vetiver brings and it possesses a certain 'olfactory temperature' that I immediately recognise: Guerlain's illustrious Djedi instantly springs to mind. Star-shaped tobacco flowers and jasmine tippy-toe over generous splinters of cured tobacco leaves, and a spicy warmth spreads laterally across the heart of this perfume. Here is where Fleurs de Tabac and Tabac Blond converge slightly in style (though the former lacks the punchy clove and leather notes that the latter possesses). A rich amber/vanilla base can be felt through a a light haze of smoke, and as the perfume dries down it becomes increasingly fleecy and powdery. A sensual muskiness reveals itself - one that can be likened to the sensation of burying ones face in the plush fur or hide of a magnificent beast. With it's final whispers, Fleurs de Tabac becomes a cas fortuit of carnality. When coming to know this perfume, it is an important revelation to discover that Ota Polacek opened a second outlet after the store on Champs Elysées was established, and that was in Havana, Cuba. I would speculate that the raw tobacco materials used to create Fleurs de Tabac might well have been sourced (and even distilled) locally, and a retail outlet created to meet the demands of the Cuban contingent. Whatever the case, Fleurs de Tabac is a virtually unknown tobacco perfume which possesses all I love about the Art Deco age. Although not having made a splash in the industry for decades, it is interesting to note that Chérigan Paris have a basic website, registered through a company in the Netherlands. Just wondering: How wearable would you assess Fleurs de Tabac? Not that I'd be expecting complete mainstream, nor would I want it. Just wondering what strength we're talking about both as regards tobacco and the overall fragrance. Sounds fascinating, whatever the case. I find Fleurs de Tabac "completely" wearable, as there is a very strong Vetiver component. In terms of the tobacco... to my nose it is not as 'in your face' as perhaps Tabac Blond is, but there is an ambery warmth with spiced tobacco at its heart. I don't shout from the rooftops about many perfume purchases, and in all honesty I did think twice about blogging this piece, purely and simply because I wasnt sure if I wanted to reveal this gem publicly. I personally struggle with a lot of tobacco perfumes, but this one, Michael, is a joy to wear. Dimi, thanks for your feedback; much appreciated. What a lovely review... love the pics, the flacon and your description. Hmmm... it makes me want to smoke a nice cigarillo now, so I take it your review is very effective. ;) Do enjoy it and I dab some Tabac Blond instead. Enjoy that wonderful Tabac Blond! I think tobacco scents like these ought to experience a renaissance. Maybe I should make my own? Somewhere in Miami there might be a few vintage bottles . I am an admirer of The Revolution but see no problem now with the Government finding out if they could buy the license for this beauty . The French have always traded with Cuba so find a nose to re-create it. There are more and more tourists going to the Island .Raul is promoting ( slowly) private business .So you don't rely on sugar and cigars alone you play on the romance of the fragrances such as Habanita etc. So when I figure out how I get to contact Raul Castro I'll put it to him.If Che Guevara bought Caron's Fleur de Rocaille for his wife they can't argue that fragrance is a luxury they don't need .Now I am fantasizing that in some half fallen building there is a stock of this. stuff . Is this perfume still available anywhere?? This was the most loved scent my husband ever owned. When our son was 2 in 1984, he climbed up on the dresser and of all the bottles, this is the one that crashed to the floor. I would love to find it again. Hello Isis, yes, it turns up from time to time on ebay. Best of luck! I just acquired a beautiful bottle of this gorgeous tabac scent. Reading your beautiful description, Dimitri, really helped me to enjoy and understand the notes in this perfume! Opulent pipe tobacco, sweetened with ambery softness and vanilla .. It is delicious and for me, sharper and more distinctive than Tabac Blond .. though I also love the Caron .. My bottle has an exquisite fan shaped bouchon and came to me sealed and in its original box! A lucky find on Ebay France!! Thank you for your great blog!